RTE presenter Miriam O'Callaghan is under attack from Sinn Fein for putting tough questions to the late Martin McGuinness about his links to IRA killings. The Prime Time broadcaster's work has been described as "utterly repulsive" by the new party leader, Mary Lou McDonald. The attack on the "southern media" comes amid allegations in Northern Ireland that Sinn Fein is trying to censor the media. The party denies orchestrating a campaign to boycott the Stephen Nolan Show on BBC NI, and criticised U105 presenter Frank Mitchell after he indicated his support for the Northern Ireland football team. Both Ms McDonald and her predecessor Gerry Adams question Ms O'Callaghan's professionalism in contributions to a new book by republican author Jude Collins. They are intensely critical of Mr McGuinness's treatment "by the media in the south" during the 2011 presidential election campaign. In particular the pair single out Ms O'Callaghan . After using the phrase "utterly repulsive", Ms McDonald wrote: "I'm thinking of Miriam O'Callaghan and RTE with their 'How do you sleep at night?' I'm thinking of the nonsense of Vincent Browne (though he is a person I personally like). "You would swear listening to these people that Martin McGuinness was the trigger that caused the northern Troubles. The utter hypocrisy of it." She adds that the coverage was "absolutely obnoxious" and claims RTE breached their public service remit. During the debate in October 2011, the long-serving journalist asked Irish presidential candidates about their religious beliefs. First and Deputy First Minister Ian Paisley and Martin McGuinness at Stormont at the first British Irish Council meeting 2007. 19/7/2011. PACEMAKER PRESS INTL. BELFAST. Darren Clarke returns home to Royal Portrush golf club with the Open trophy he won at the weekend., met by Deputy First Minister Martin McGuinness. Picture Charles McQuillan/Pacemaker. Pacemaker Press Belfast: 09 May 2013: The first and deputy first ministers have announced how they intend to progress building a shared future in Northern Ireland. First Minister Peter Robinson said the proposals are the most ambitious ever brought forward on the issue. Among them is the target of bringing down all of Northern Ireland's peace walls by 2023. Mr Robinson and Deputy First Minister Martin McGuinness said this could only happen in tandem with the communities affected. Picture By: Arthur Allison. Pacemaker Press Belfast 07-12-2012: US Secretary of State Hillary Clinton has arrived in Belfast as part of a four-day trip to Europe. US SOS Hillary Clinton pictured at Stormont Castle with Northern Ireland's First and Deputy First Minister, Peter Robinson and Martin McGuinness. Picture By: Arthur Allison. Pacemaker Press Belfast 21-06-2013: The British-Irish Council meeting was held in Magee College, Derry~Londonderry. Peter Robinson MLA First Minister and Martin McGuinness MP MLA deputy First Minister host the event. The British-Irish Council was established as part of the multi-party agreement reached in Belfast on 10 April 1998. Its membership comprises representatives from the Irish Government; UK Government; Scottish Government; Northern Ireland Executive; Welsh Government; Isle of Man Government; Government of Jersey and Government of Guernsey. Picture By: Arthur Allison. Pacemaker Press Belfast 11-10-2013: Prime Minister David Cameron has said Northern Ireland is second only to London in the UK as the top destination for inward investment. Mr Cameron is pictured with Northern Irelands First minister Peter Robinson & Deputy First Minister Martin McGuinness at Stormont Castle after attending major investment conference in Belfast. Picture By: Arthur Allison. PACEMAKER BELFAST 4/6/2008. Bridge to the Future... First Minister Ian Paisley and Deputy First Minister Martin McGuinness pictured with Scottish First Minister Alex Salmond and Dan Sten Olsson, Chairman of Stena Line, Conor Murphy Minister for Regional Development and Len O'Hagan, Chairman of Belfast Harbour Commissioners on the bridge of the Stena HSS at the official opening of the new £37million Stena Line Terminal at Belfast Port today. Picture Charles McQuillan/Pacemaker. 20/5/2010. PACEMAKER BELFAST. PRIME MINISTER DAVID CAMERON AND NORTHERN IRELAND SECRETARY OF STATE MEET WITH FIRST MINISTER PETER ROBINSON AND DEPUTY FIRST MINISTER MARTIN MCGUINNESS AT STORMONT CASTLE THIS AFTERNOON. PICTURE CHARLES MCQUILLAN/PACEMAKER. 5/2.10 PACEMAKER PRESS INTL. GORDON BROWN, PETER ROBINSON, MARTIN MCGUINNESS AND BRIAN COWAN TALK TO THE PRESS THIS MORNING AT HILLSBOROUGH AS THE DEAL FOR DEVOLVING POLICING AND JUSTICE WAS FINALLY DONE LATE LAST NIGHT. PICTURE CHARLES MCQUILLAN/PACEMAKER. 27/1/2010. PACEMAKER BELFAST. GERRY ADAMS AND MARTIN MCGUINNESS HOLD A PRESS CONFERENCE INSIDE HILLSBOROUGH CASTLE. PICTURE CHARLES MCQUILLAN/PACEMAKER. 29/9/2010. Former President of the United States Bill Clinton departs Magee College to cheers from students eager to catch a glimpse of the world statesman as he posed with First Minister and Deputy First Minister Peter Robinson and Martin McGuinness alongside John Hume. Picture: Charles McQuillan/Pacemaker. 30/1/2010. PACEMAKER PRESS INTL BELFAST. DRESS DOWN SATURDAY. DEPUTY FIRST MINISTER MARTIN MCGUINNESS ARRIVES AT HILLSBOROUGH CASTLE. PICTURE CHARLES MCQUILLAN/PACEMAKER. PACEMAKER BELFAST 14/7/2010 PSNI Chief Constble Matt Baggott meets with First and deputy First ministers Peter Robinson and Martin McGuinness this afternoon to discuss the on going security situation in North Belfast after the 12th July. PACEMAKER PRESS BELFAST 10-03-2009: The First Minister Peter Robinson was joined by the Deputy First Minister Martin McGuinness and Chief Constable Sir Hugh Orde at a press conference at Belfast Stormont Castle. They condemned the murdered policeman Constable Stephen Paul Carroll, 48, a married man with children from the Banbridge area of County Down Northern Ireland . PICTURE BY: ARTHUR ALLISON. PACEMAKER PRESS INTL BELFAST 11/11/2009. First Minister Peter Robinson and Deputy First Minister Martin McGuinness greet Irish Foreign Secretary Micheal Martin at Stormont castle this morning. Picture Charles McQuillan/Pacemaker. PACEMAKER PRESS INTL BELFAST 11/11/2009. First Minister Peter Robinson and Deputy First Minister Martin McGuinness wait to greet Irish Foreign Secretary Micheal Martin at Stormont castle this morning. Picture Charles McQuillan/Pacemaker. PACEMAKER PRESS 24-04-2009. Martin McGuinness arrives at Free Derry corner for his press conference this afternoon concerning the death threats made against him by dissident republicans. Picture Charles McQuillan/Pacemaker. Pacemaker Press International Belfast 16/7/2007. First and Deputy First Minister Ian Paisley and Martin McGuinness pictured today at Stormont at the British Irish Council meeting 2007 . Picture Charles McQuillan/Pacemaker. Pacemaker Press International Belfast 12/7/2007. HOWZAT!? First and Deputy First Ministers Ian Paisley and Martin McGuinness pictured this evening with Ireland's cricket captain Trent Johnston and spin bowler Kyle McCallen. The Irish cricket side were at Parliment Buildings in honour of their heroic exploits at the Cricket World Cup. Picture Charles McQuillan/Pacemaker. PACEMAKER PRESS INTL 1-05-2007:President of the European Commission Jose Manuel Barroso pictured meeting Northern Irelands First and Deputy First Ministers the Rev Ian Paisley,MP,MLA and Mr Martin McGuinness MP, MLA at the steps of Parliament Buildings in Belfast. PICTURE BY: ARTHUR ALLISON. Pacemaker Press Belfast 19-09-2016: Martin McGuinness to call on British government to fund legacy inquests. Sinn Féin MLA Martin McGuinness pictured speaking to the media ahead of this afternoon's meeting with British Secretary of State James Brokenshire on the need for the British government to live up to its responsibilities on addressing the legacy of the past. Mr McGuinness will call on the British government to release funding for legacy inquests, including the Ballymurphy massacre cases. Picture By: Arthur Allison. Pacemaker Press International Belfast 16/7/2007. First and Deputy First Mnister Ian Paisley and Martin McGuinness pictured today at Stormont at the British Irish Council meeting 2007 . Picture Charles McQuillan/Pacemaker. PACEMAKER PRESS BELFAST 10-03-2009: The First Minister Peter Robinson was joined by the Deputy First Minister Martin McGuinness and Chief Constable Sir Hugh Orde at a press conference at Belfast Stormont Castle. They condemned the murdered policeman Constable Stephen Paul Carroll, 48, a married man with children from the Banbridge area of County Down Northren Ireland . PICTURE BY: ARTHUR ALLISON. PACEMAKER BELFAST 20/11/08 First Minister Peter Robinson (front right) and deputy First Minister Martin McGuinness (front left),at the Northern Ireland Executive meeting in Stormont Castle ,20th November 2008,The Northern Ireland Executive will met today for the first time since June after the Democratic Unionist Party (DUP) and Sinn Fein agreed an end to their stand-off.An economic aid package is expected to top the agenda at today's meeting after a delegation yesterday met Prime Minister Gordon Brown to appeal for financial support. PACEMAKER BELFAST 4/6/2008. First Minister Ian Paisley, Deputy First Minister Martin McGuinness, as they officially opened the new £37million Stena Line Terminal at Belfast Port today. Picture Charles McQuillan/Pacemaker. Pacemaker Press Belfast 9-05-2011: Martin McGuinness and Gerry Adams of Sinn Fein pictured during a Press Conference in Belfast this afternoon, where the pair spoke of the parties success in last wekends election. Picture By: Arthur Allison. PACEMAKER BELFAST 28/01/2012 - Power NI Dr McKenna Cup Final, Tyrone v Derry, at Armagh. Peter Robinson, accompanied by Martin McGuinness, attended the McKenna Cup final. Martin McGuinness signs resignation letter. She then turned to Mr McGuinness, and noting his IRA past, said: "How do you square, Martin McGuinness, with your God, the fact that you were involved in the murder of so many people?" Ms O'Callaghan declined to comment, but an RTE spokesperson said: "RTE covered Martin McGuinness's 2011 Presidential candidacy in a fair, objective and impartial manner." The coffin of Northern Ireland's former deputy first minister and ex-IRA commander Martin McGuinness is carried down Westland Street into the Bogside ahead of his funeral at St Columba's Church Long Tower, in Londonderry. The funeral cortege of Martin McGuinness passes through the streets of Derry on March 23, 2017 in Londonderry. Crowds gather outside the home of Martin McGuinness ahead of his funeral. 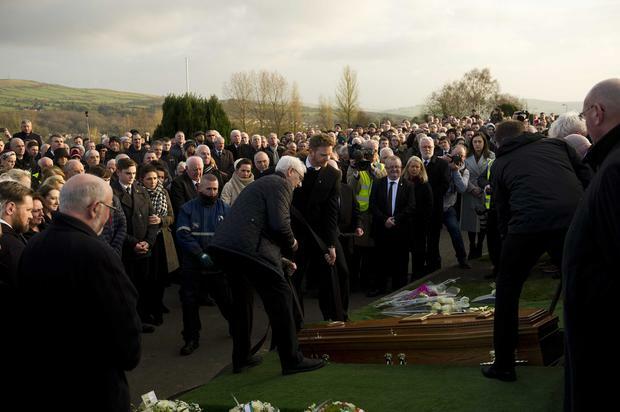 Mourners gather at the home of former Northern Ireland Deputy First Minister Martin McGuinness in the Bogside area of Derry on March 22, 2017. A sign directing mourners to the wake of former Northern Ireland Deputy First Minister Martin McGuinness is pictured in the Bogside area of Derry. A man walks past a Republican mural in the Bogside area of Derry on March 22, 2017.